My favorite show growing up was The Carol Burnett Show. Every week she made me laugh until my sides hurt. I never got tired of seeing Carol and her cast mates get into all kinds of funny situations. I loved the different characters they played. Mrs. Wiggins & Mr. Tudball were my favorite, and anything with Tim Conway. Everything he did cracked me up. Vicki Lawrence did an amazing job in everything she did, and grew so much as an actor. I loved seeing Tim Conway and Harvey Korman do skits together. They had such a hard time not laughing, and failed quite a lot. And then there were The Old Folks and The Family. I’ll never forget “Went With The Wind” when Carol wore the curtain dress, The Pigeon Lady, and As The Stomach Turns. I really miss this show and wish I could watch re-runs on tv. It never got old. This book brought back a lot of memories, and now I’m jonesing for a Carol Burnett Show fix. I might have to go buy the series on dvd. I remember that show so well. As I was reading down through your review, I remembered Carol in that ‘Tara’ dress with curtain rods on her shoulders – LOL! So, so funny. And the best part of that show was when they would crack each other up and have a wait a bit before continuing so they could get their faces under control. Loved it! I’m going to be looking for this book. Thanks for sharing about it! My library has this on audio and I’ve been thinking about getting it even though I haven’t really seen the show (it was off the air by the time I was old enough to watch it). 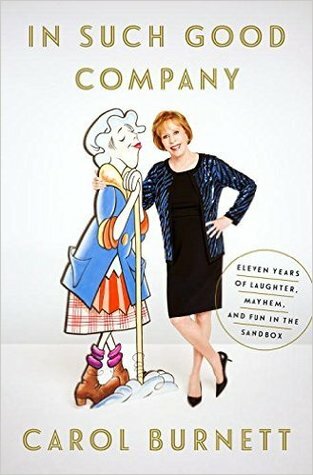 I love the Carol Burnett I’ve seen in interviews and I think this book sounds delightful! She is such a great comedienne and a class act to boot. I’m sure this is great. I love Carol Burnett. She is so funny and hasn’t need to resort to vulgar humor. I love that about her. Sounds like a good book! Vicki, I adored this show as well when I was growing up. This sounds 100% wonderful. Terrific review! I love Carol Burnett. Watched the show faithfully as a kid, along with Vicki’s spin-off, Mama’s Family. I am keen to read the book and hear her stories. I imagine there’s more than a few laughs inside! Oh yes, she was a part of my growing up. Loved how Tim Conway could always get Harvey Korman giggling. Those were the good old days of television. She is a fantastic entertainer. I didn’t know she wrote a book. I will have to look for it. Thanks for the review.